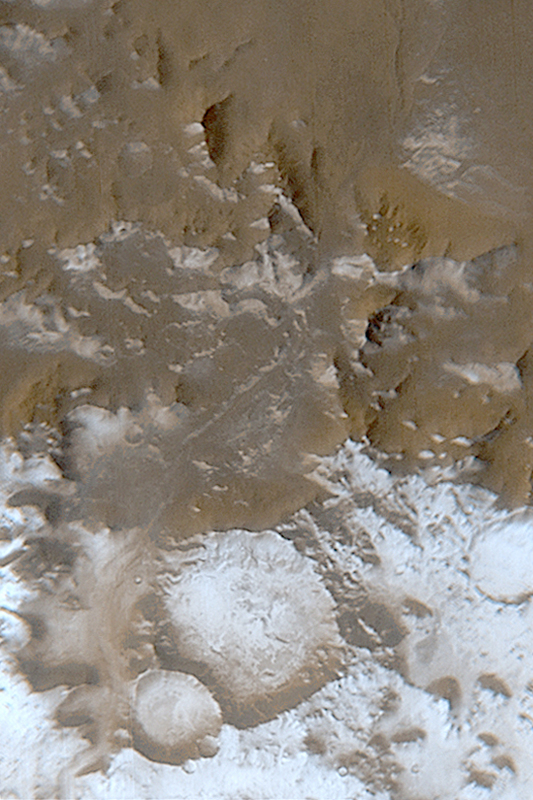 This is a Mars Global Surveyor (MGS) Mars Orbiter Camera (MOC) wide angle view of the Charitum Montes, south of Argyre Planitia, in early June 2003. The seasonal south polar frost cap, composed of carbon dioxide, has been retreating southward through this area since spring began a month ago. The bright features toward the bottom of this picture are surfaces covered by frost. The picture is located near 57°S, 43°W. North is at the top, south is at the bottom. Sunlight illuminates the scene from the upper left. The area shown is about 217 km (135 miles) wide.